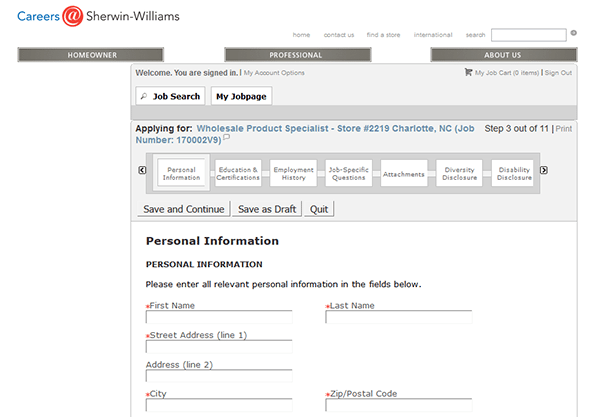 Go to the company’s careers website to access the Sherwin-Williams job application. Numerous types of careers can be applied for online including management/sales, corporate, distribution/transportation, and internal audit positions. Read the guide posted below for more detailed information regarding the online hiring process. 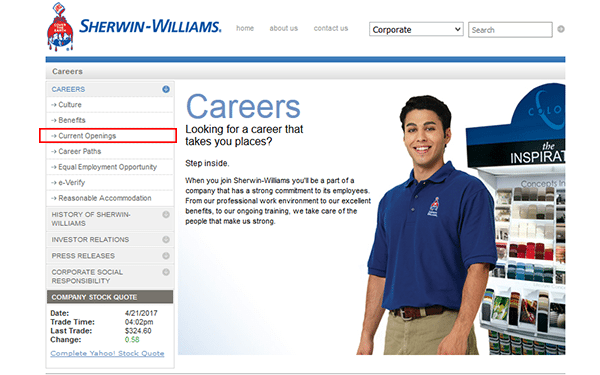 About the Company: Sherwin-Williams is an American building materials company with over 4,000 retail locations. The company was formed in 1866 and is headquartered out of Cleveland, Ohio. Sherwin-Williams serves an international market (mainly North/South America and Europe). Step 1 – Learn more about current openings as well as different careers paths by going to the company’s careers site (click here). 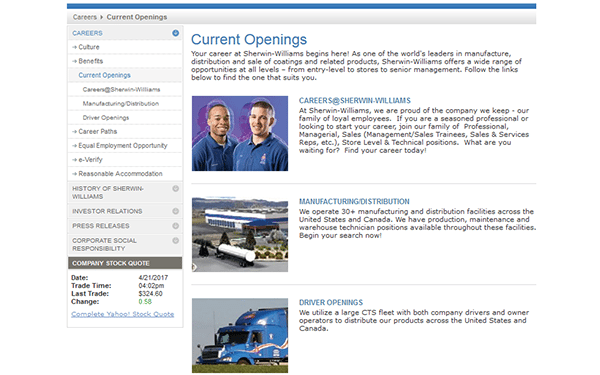 Step 2 – Click the “Current Openings” link. Step 3 – Select the type of career path that you’re interested in (e.g. “careers,” “manufacturing/distribution,” or “driver openings”). 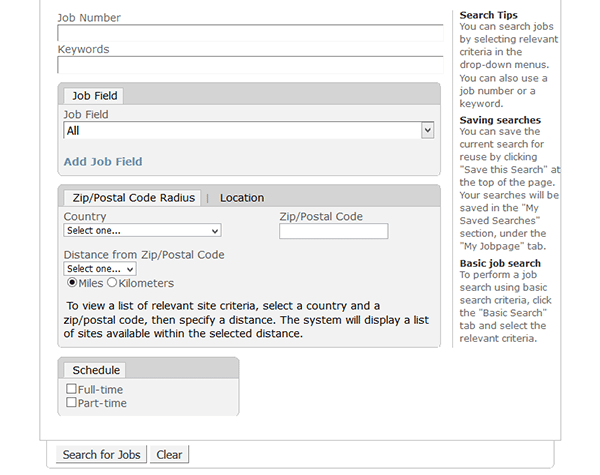 Step 4 – Search for current openings by entering a keyword into the search form and then selecting/entering a location. Step 5 – Press the job title of the position you’re interested in to go to the next step of the process. 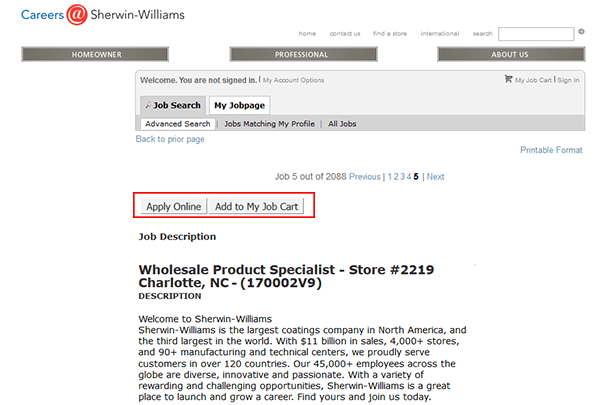 Step 7 – Press the “Apply Online” button to move to the next step. 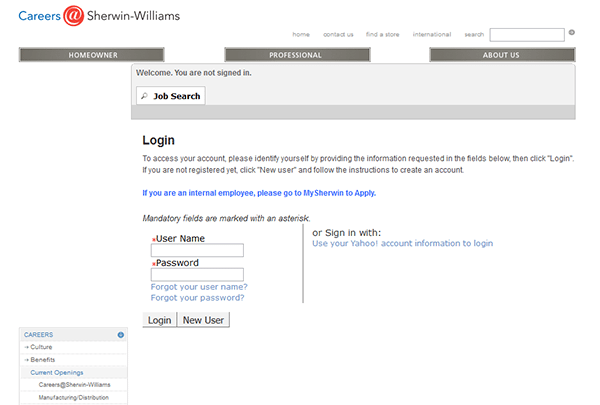 Step 8 – Log in to your account. If you need to register a new account press the “New User” button. Step 10 – Click the “Register” button. Step 11 – Accept the privacy agreement. 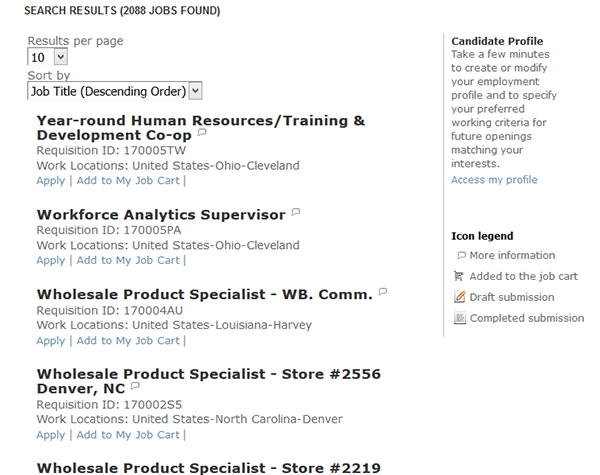 Step 12 – Source Tracking – Select how you heard about this job from the drop-down list. Step 13 – Resume Upload – Use this section to upload your resume. You also have the option of importing data from your LinkedIn account.